Shoulder pain is a problem that is quite common and it has a number of different causes. Often, it is an indication of another problem. Shoulder pain may occur due to the following reasons: • Bad posture • Frozen shoulder – which is a painful condition that lessens normal movement in the shoulder joint (this can at times hinder movement in the shoulder completely) • Rotator cuff conditions – the rotator cuff is a bunch of muscles and tendons surrounding the shoulder joint, whose function is to keep it stable • Shoulder instability – in this case, the shoulder may be unstable and also have an abnormally large range of movement referred to as hypermobility • Acromioclavicular joint disorders – ailments such as osteoarthritis which affect the joint located at the top of the shoulder (the acromioclavicular joint) • Osteoarthritis in the shoulder joints • A broken (cracked) bone, for instance a broken collarbone or a fracture of the upper arm bone (humerus) In some cases, shoulder pain may not occur due to a problem in the shoulder joint but rather in a different area, like the neck, which can be felt not only in the shoulder but also in the upper back. 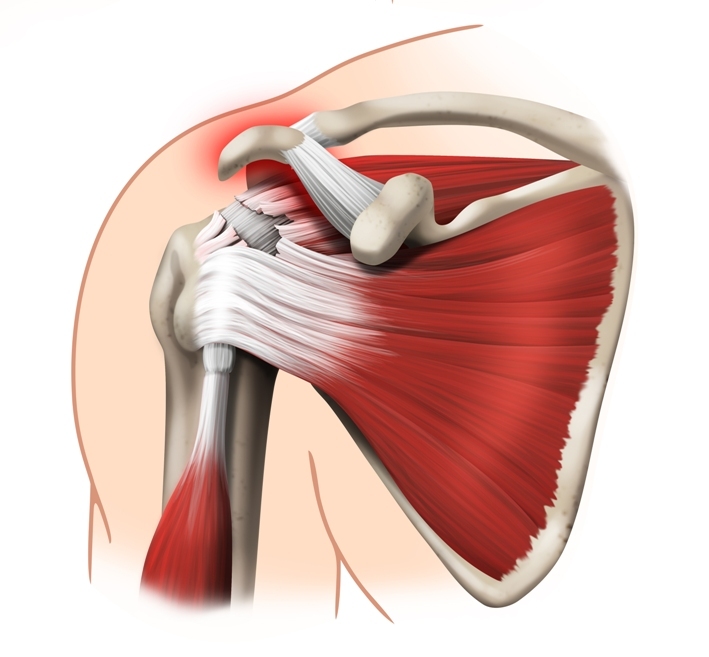 Rotator cuff The rotator cuff comprises of a cluster of four tendons and muscles. These converge around the shoulder joint located at the top of the upper arm bone just above the elbow, known as the humerus. They combine to form a “cuff”, which holds the arm in proper position and enables it to move in different directions. The shoulder happens to be one of the most mobile joints; however, it is somehow weak. Subjecting it to too many fastballs for instance, can cause not only partial tears but inflammation in the rotator cuff’s tendons. Sudden stress can even cause one of the tendons to be jerked from the bone or to tear right in the middle of the tendon. 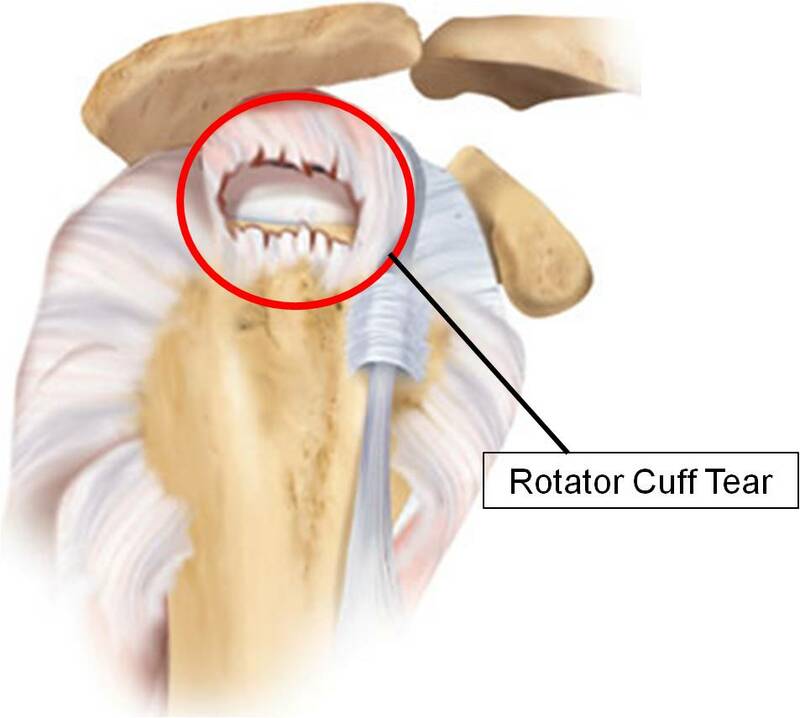 Rotator cuff tears and diagnosis Rotator cuff tears are common in swimmers, tennis players, pitchers and several other athletes and a rotator tear could as well end a player’s career if it is serious. A proper diagnosis of the shoulder pain will ensure that right treatment is done. Symptoms, physical examination, and various types of X-rays as well as related investigations can provide a lot of information regarding the nature of the problem. However, shoulder arthroscopy is often used to determine the exact cause of the problem. To diagnose a rotator tear, a thorough physical exam is conducted to allow the doctor to rule out other disorders and confirm that the patient has a rotator cuff tear. The types of syndromes which can be diagnosed using arthroscopy include tears, inflammation, detachments, abnormal formations, loose fragments/bodies, and arthritis. Arthroscopy can’t diagnose all the disorders and so proper examination is required before determining if arthroscopy is appropriate for the patient. Surgical Animation Arthroscopy is generally referred to as “key-hole surgery”. Normally, only two or three puncture wounds measuring 5mm are required. This tends to avoid large wounds and scars. 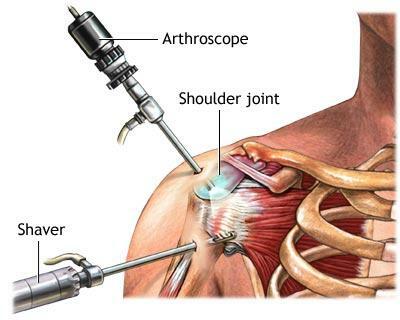 Presently, most shoulder surgeries can be done by arthroscopy instead of open surgery. The treatment of rotator cuff tears with shoulder arthroscopy is contentious. While some orthopaedic surgeons use arthroscopy to treat every rotator cuff tear, some choose specific tears, and others treat all tears open. As such, there is no agreement on which procedure is better. Contact our sports medicine specialists at Orthopedic Surgery San Diego for an evaluation to provide you with the best care suited to your needs.